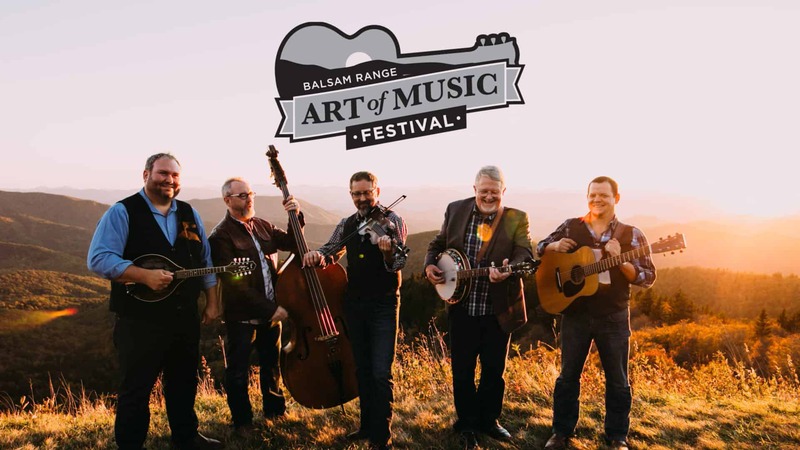 Balsam Range will host their 3rd annual musical celebration in breathtaking Lake Junaluska, now THREE days long! The festivities include world-class artists and music related workshops, handcrafted instrument building, songwriting, dancing, and of course a top notch lineup. A jam packed evening of bluegrass with one of the industry’s all time greats. Terry Baucom has been one of the most influential artists within the bluegrass genre. This be memorable event will include some special performances by individual members of Balsam Range. Get the unique chance to hear Caleb Smith and Tim Surrett performing some individual pieces and styles that have influenced them over the years. Join Milan Miller, John Wiggins, Mark Bumgarner and Aaron Bibelhauser with Balsam Range’s Buddy Melton and Darren Nicholson for an evening of original music made by masters of the craft of songwriting. $30 Ticket includes a traditional Southern Appalachian barbecue meal followed by a performances by some of Americana’s most impactful and influential songwriters for a special night of music, fellowship and fun in the historic Hazelwood School. Get Tickets Here. 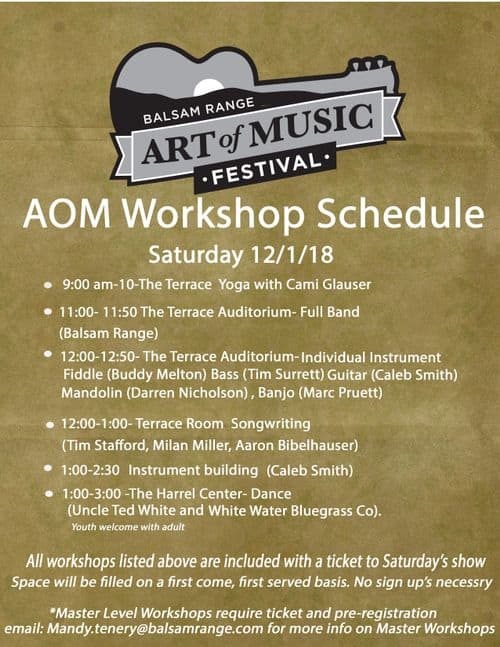 Any AOM ticket holder can partake in one of several workshops on the grounds of Lake Junaluska ranging from songwriting, to dance or you can learn from the Balsam Range guys themselves. All are welcome to these Saturday sessions. Choose to stay onsite where the magic happens or rest your head in a tranquil mountainside cabin. There will be activities going on all day long at Lake Junaluska with the opportunity to connect with other artists and walking distance to the concerts, workshops and more. Join in on jam seshes and bring your own instrument for some fun! Cataloochee Ranch will be offering free shuttles to the events at Lake Junaluska for guests. 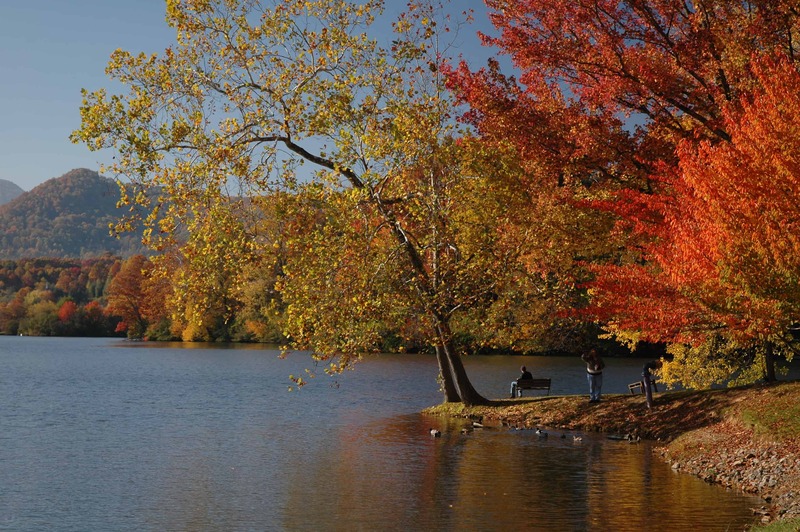 Lake Junaluska is offering a variety of lodging packages for single, double, triple and quad occupancy. Pricing varies. The Terrace Hotel is conveniently located across the street from Stuart Auditorium where the evening concerts will take place and the hotel will also host workshops on Friday, November 30th. Lambuth Inn is a historic and charming hotel set on the hill near the beautiful Inspiration Point garden. Hillside Lodge is located near the Aquatic Center on Lake Junaluska with motel style rooms. Thursday Night Concert – CHOOSE from a night at Colonial Theater in Canton featuring Terry Baucom’s Dukes of Drive OR go to Waynesville and enjoy Monogram, a bluegrass band from Prague, along with a traditional Czech meal. * Note: Packages will not be available online, you must call to receive this special rate. Balsam Range was just awarded 2018 “Entertainer of the Year” at the IBMAs (International Bluegrass Music Awards). While you’re in town make sure to take advantage of Haywood County’s many farm to table restaurants and one of a kind cuisines. See all we have to offer here.